I watched an interview with former president George W. Bush on the Today Show yesterday, and was stunned to see how normal he is in comparison to Trump. When Bush said that the power of the presidency can be addictive, and that an independent media is necessary to keep things in check, I almost couldn't believe what I was hearing. My memories of Bush involve a clown blundering his way through his last term. He left office as one of the most reviled presidents in our history at that point. In a case of you ain't seen nothing yet, Chump is making Bush look pretty good. I can't believe I just said that! One thing you can say about Bush is he isn't an egomaniac like Lump. He also genuinely cares about veterans. Maybe it's out of guilt for leading us into a war that should never have happened. Bush talked about his new book which features paintings he did of each individual veteran who was profiled. In contrast to Trump's "it's all about me" attitude, Bush's book features people who served their country. 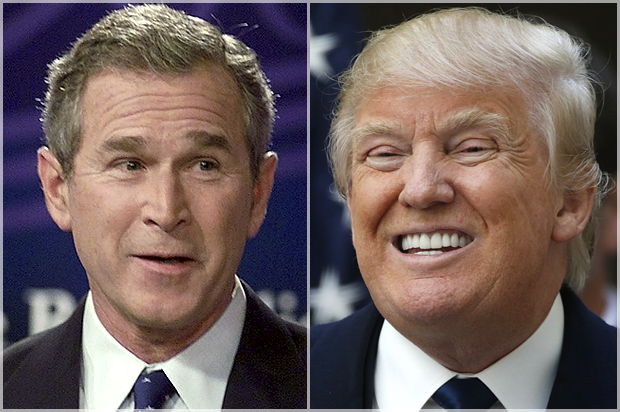 The difference between the two men is one is a blundering clown (Bush), and the other is a very mean kid who never grew up (Rump) and can't stop telling lies. Did Bush lie while in office? Hell yes, he did! Just not every day Like Dump. Politifact has followed Hump's presidency and reports there hasn't been a day since he's been in office where he hasn't told a lie. I doubt if there's every been a politician who hasn't lied about something. Don-the-Con however has made an art out of it. No one can look you in the eye and lie like him. Bush's evil sidekick was Cheney. Chump's is Steve Bannon who makes Cheney look like a Nobel Prize nominee. I never had the feeling Bush purposely wanted to cripple our society with an illegal war. He was heavily influenced by Cheney and his cronies. Unlike Donny-Little-Hand who has plenty of advisers that he mostly ignores. Bad boy Bannon would be the exception. He's another angry kid trapped in a man's body. I've little doubt that history will treat Bush better than Dump. I'm not absolving Bush for his crimes, but I never had the feeling he purposely wanted to create chaos and promote racism. America, and the rest of the world, is watching with concern as Lump attacks the Republic, minorities, and anyone who tries to stand in his way with facts and laws. Our first illegitimate president is like a kid who can't wait to blow out the candles of his birthday cake and plunges into it face first with squeals of glee. It's just a matter of time before responsible adults send Little Donny on his way and fumigate the White House.